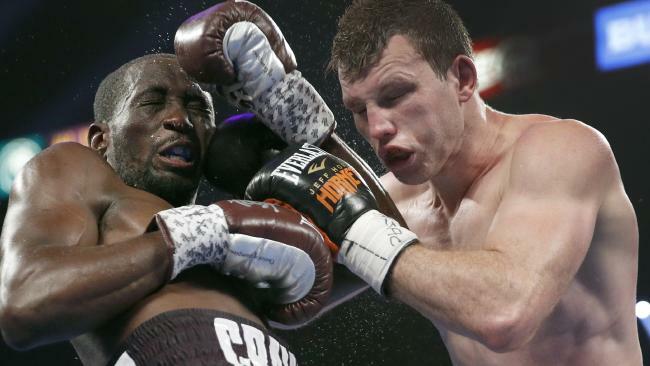 IN a tragic day for Australian boxing Jeff Horn lost his WBO world welterweight title to brash American Terence Crawford by ninth round stoppage in Las Vegas. 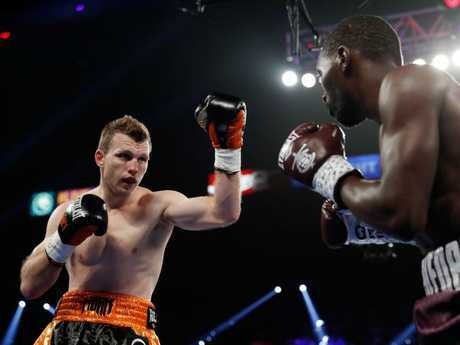 Horn climbed back from a knockdown in the ninth but was all target as the American unloaded another flurry of punches to force local referee Robert Byrd to end what had been a brutal one-way beating. "He's a tricky boxer, we thought we could get him, but good on him," Horn said afterwards. "I coud have kept him guessing, maybe I was a bit predictable. "He's a classy fighter, hopefully he shows some humility. The end came at 2min 33sec of the ninth round. 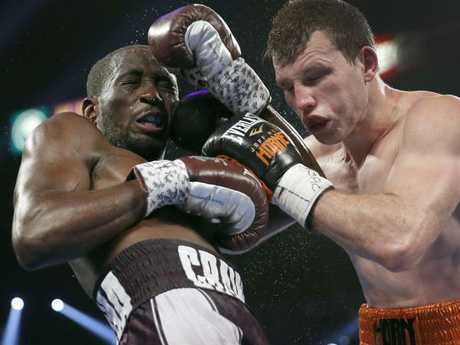 The courageous Horn was all class in defeat but could not match Crawford for speed or punch accuracy. The first round was fairly even. Horn was clipped early but came back strong. Crawford dominated the next two rounds with his silky skills and in the fourth was so confident of victory he started smirking towards Horn's corner. In round five he started poking his tongue at the gutsy Brisbane fighter who was marked around both eyes. The Hornet tried to swarm Crawford in Round 6 but he was met with sharp repellant every time in the shape of the southpaw's deadly right jab and snapping left cross. Horn's defence was just too porous. Even when he managed to land some hard shots in the sixth Crawford met him with big body shots and a sizzling uppercut and rather than be intimidated by Horn's superior size and strength he was able to throw him around into the ropes. By round seven Horn was fighting on desperation, well aware that while he had taken the early rounds against Manny Pacquiao in winning the title last July he had conceded them to the cocky American. The few hundred Australians in the crowd at the MGM Grand tried to lift Horn with chants of ``Hornet! Hornet!'' but sadly for Horn they couldn't get into help him as Crawford countered his every move and rush. Crawford was almost impossible to hit at times despite all the work Horn had done on his footwork in preparation. Crawford's movement and punch placement were mesmerizing. In Round 8 he set Horn back on his heels but the brave battler from Acacia Ridge kept coming. He was badly staggered at the end of the round as Crawford cut loose and appeared to be on the verge of going down. In Round 9 Crawford finished the job, winning his third world title. "Y'all tried to compare me to Manny Pacuqiao. Look what I just did" Crawford said afterwards. "I want the other champions. I want the big fights. Bob, let's make it happen"